Derek Sheils won the Grand Final Superbike race at Killalane to complete a double. Derek Sheils dominated the Grand Final at the East Coast Racing Festival at Killalane to bring the curtain down on the 2018 Irish road racing season. The Dubliner, back in action on the domestic scene for the first time since taking some time out following the ill-fated Skerries 100 in July, was in a league of his own on the Burrows Engineering Racing Suzuki GSX-R1000, taking the chequered flag by 18 seconds from Michael Sweeney (MJR BMW). Paul Jordan was a further five seconds back as he took third place, with Thomas Maxwell, Kevin Fitzpatrick and Paul Gartland finalising the top six. 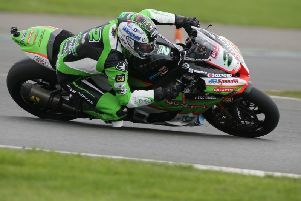 Sheils’ team-mate, Davey Todd, plus Derek McGee did not start the race. Skerries man Sweeney made it a double as he won the Supertwins race from Todd and Stephen McKnight. Irish champion McGee, still not fully fit after his crash at Dundrod, decided to sit out the race. Liam Chawke won the Senior Support race from Wayne Sheehan, with Brian Loughlin victorious in the Junior Support race from Barry Sheehan. Davy Morgan won the Lightweight race from Darryl Tweed. Phillip Shaw and Barry Davidson were the respective winners of the Senior Classic and Junior races.